While turning on your oven might be the last thing you want to do in this heat wave, guaranteed you’ll want to turn it on for this plum tart. With juicy plums and a buttery crumble, this is the perfect end-of-summer dessert—especially when topped with creamy ice cream. This recipe serve about 8, so it’s also great for sharing with friends (and you’ll get compliments galore! ), unless you’re like me and want to keep it all to yourself. Not only is this tart super delicious, but it’s also incredibly easy. Your friends will be blown away! Don’t give away your secrets though—pretend you slaved away over it. No one needs to know. This recipe is loosely adapted from a similar Food Network recipe by Ina Garten. Optional: don’t have enough plums? Replace half with apples for an apple plum combo! In a large bowl, combine flour, walnuts, and sweetener. Once mixed, add butter, egg yolk, and salt. Mix either in an electric mixer (on low) or by hand until crumbly. Take 1.5 cups of the crumble mixture and press onto the bottom of a 9.5 inch tart pan (or skillet). Mix plums and vanilla in a separate bowl. Add plums and place on top of crumble mixture, skin side down. If you want to get fancy like Ina Garten, arrange the plums in a flower-shaped fashion. Begin on the outside and work your way in—like a flower. 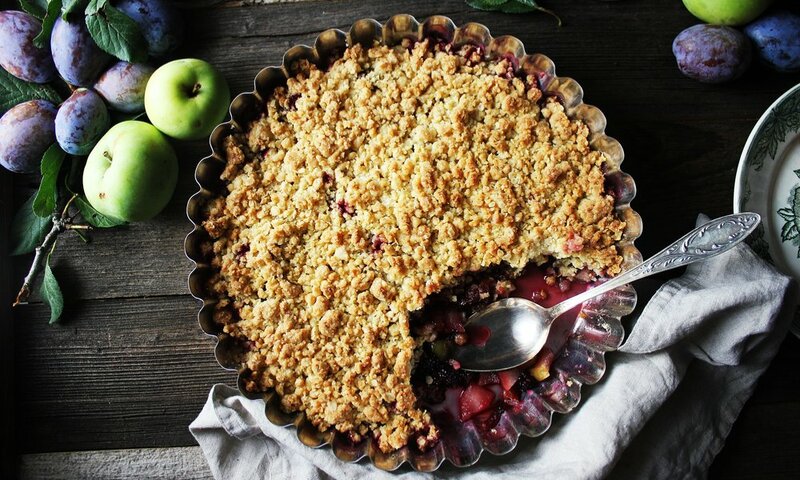 Sprinkle the remaining crumble atop the plums. Bake the tart for 40-50 minutes, or until the juices are bubbling and the top is crisp. Remove and let cool for about 10 minutes. Serve solo or with toppings of choice (we like ice cream). What’re your favourite plum recipes? Let us know in the comments below. And be sure to grab organic plums fresh from our orchard! previous post: Wondering What’s In Season And When? Check Here!